Feature packed and capable, but certainly not cheap. HP's Officejet range is built for those who need fast printers. A. HP Photosmart does a better job of high-end photo printing (but as our tests proved, the Officejet is no slouch as an image printer), but if you plan to print large documents or share it in a small office environment where people do a lot of printing, you really need an Officejet. 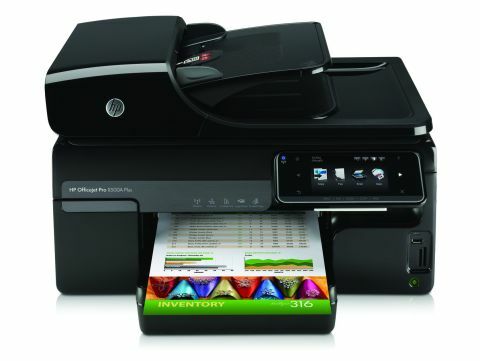 This particular top-of-the-range, all-in-one A4 Officejet can print, scan, photocopy, fax and print from the web using HP's new ePrint technology. HP claims its print speeds rival those offered by a laser printer, but cost around 50 per cent less. The Officejet Pro 8500A Plus uses HP's ePrint technology, enabling you to print from any device that can send an email, with no additional software required. It's easy to use. Just attach a compatible document or image to an email, and send it to your printer's unique email address. It's very useful for house guests, or for visitors to your office. Compatible documents include PDFs, Microsoft Word and PowerPoint files, plain text and images saved as JPG, TIFF, BMP, PNG and GIF. It's fairly painless to set up, and works very well. You can connect the printer to your computer through USB 2.0, or to your network using Ethernet or Wi-Fi 802.11b/g/n. It uses four pigment-based ink tanks, holds 250 sheets in its paper tray and has a 50-sheet automatic document feeder. It supports popular memory card formats and printing from a USB stick, or directly from your camera with PictBridge. Duplex support means you can print on both sides of the paper, too. Being an Officejet, the 8500A Plus is very fast, printing our 20-page black-and-white test document in one minute, 30 seconds. A top-quality A4 photo print took four minutes, 35 seconds, which is also very good. But fast speeds are not at the expense of quality. Text printing is consistent, solid and clear, with no misaligned or bleeding characters. It could be a little darker, but you'd have to be very fussy to complain. High-quality photo prints on proper photo paper give rich, precise colours and well realised flesh tones. Our greyscale colour ramp did a great job of distinguishing almost-black and almost-white shades, though a little banding was evident. Default quality photo prints on standard photocopier paper look a little subdued and suffer from banding, but they're serviceable enough if premium quality isn't required. The Officejet Pro 8500A Plus isn't the cheapest multifunction inkjet, but you're getting a lot of features for your money. Our only real complaint is that there's only one paper tray and no rear sheet feeder for letterheads or photo paper, but you can add an optional second paper tray if you wish.